If you’re someone who has played Candy Crush or who is simply a fan of this game, you must have known by now that Level 17 is the toughest of all levels. Although the aim of this level is also the same as the other levels, the total number of ingredients and the controlled number of moves make this level even more challenging than what it looks. The ingredients that are there on the outer columns are those that are hard to bring down. 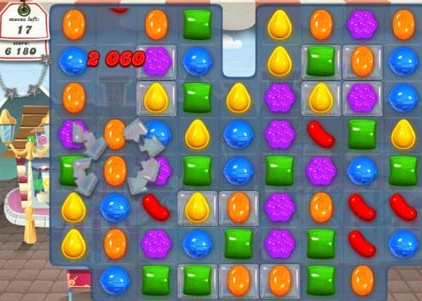 Here are some tips that can help you win level 17 of Candy Crush. Try to pull the cherries towards the center: Whenever you get the opportunity, ensure that you try your best to get the cherries on the outer columns towards the center as it is always easier and simpler to bring them at the bottom of the entire board when they’re already placed in the middle. The shape of the board makes it difficult for the ingredients to be brought down the peripheries. Hence, start getting them down to change this level into a simple one. The vertical striped candy is handy in this level: Just as other levels, here too you have to bring down the candies but make sure that the vertically striped candy will be pretty handy in this level. Don’t forget to activate the vertical striped candy when you locate it at the same column as a vital ingredient. You can also try creating horizontally striped candies and get them down to the bottom of the board. Make every move count: In level 17 of Candy Crush you have 19 moves and hence you should make each and every move count. Each move that you make should bring down an ingredient to at least a single level. Once you start wasting your moves, you will soon run out of tactics as you move towards the end of the game. Keep your goal clear. So, if you’re wondering how to win level in candy crush, you can take into account the above mentioned tricks and hints. Hope this would be a good preparation for the jelly madness that you might come across in Level 18. Don’t be surprised by seeing some more trouble in the next level as there will be more challenges to come.